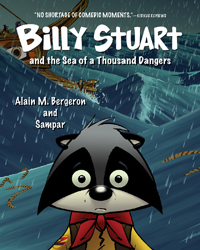 Billy Stuart is a young raccoon who aspires to be just like his grandfather, a globe-trotting adventurer who knows no fear. When he learns that his grandfather has found a way to travel through time and is leaving on another great voyage, he sets out to see him off (and maybe sneak along). Billy Stuart follows his grandfather's puzzling clues through a maze of caves and caverns to find him before he leaves, trailed by his Scout pack, the Zintrepids. What Billy doesn't know is that once they go down the fateful path his grandfather has taken, there will be no turning back. 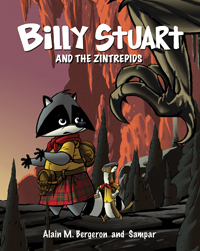 Brightly illustrated and enhanced with games and puzzles throughout, Billy Stuart and the Zintrepids is sure to amuse readers of all ages. 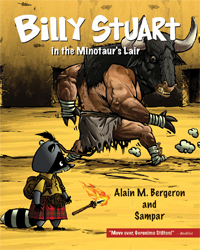 The next book in the Billy Stuart series will be available in Spring 2019. 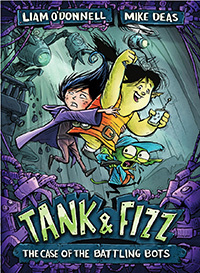 "Move over, Geronimo Stilton!...With humorous sidebars from the author, jokes and puzzles, and some pages in comic-book style, this French Canadian import should have broad appeal." "What differentiates Billy Stuart is how much easier the story is to follow than [other books of this genre] and how much better the writing is…The first Billy Stuart installment is busy but not convoluted." 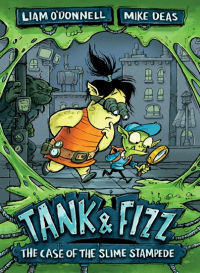 "Jon Scieszka's 'Time Warp Trio' meets 'Geronimo Stilton' in this full-color hybrid, which should appeal to reluctant readers and avid readers alike." 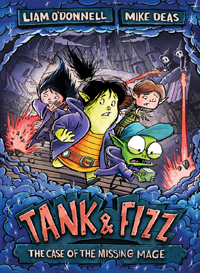 "There is a lot to recommend in this chapter book for young readers. It is full of allusions to other exciting adventures such as the 'Harry Potter' series and 'The Golden Compass' series…The graphic features of the text are vivid and action-packed!…Readers will definitely look forward to more books in this updated series. Highly Recommended." 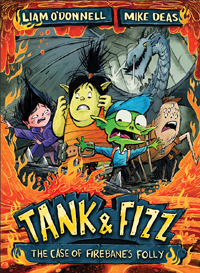 "Reluctant readers will appreciate the many visual elements in this easy-to-read novel…Elements will extend the readership to those younger than the intended audience, as well as some reading-challenged students who are older." "Full-color cartoon illustrations add a cinematic quality…Simple vocabulary, ample leading, and supporting spot illustrations make this a good transitional chapter book…An interesting series opener."